It's Thankful Thursday and Lynn of Spiritually Unequal Marriage is once again our host. Lynn has chosen the theme of victory for this week. You can join in and link there or find other participating blogs to read. Have you ever started to read a mystery book and couldn't wait to find out how it ended? I used to love to read Nancy Drew and Grace Livingston Hill books as a child. And I have to admit there were times when I peeked at the last few pages just to find out how it ended. I couldn't wait but then I returned to where I was reading even though I already knew the ending. Well, I have a news flash! I already know the ending to the greatest battle of all time. I'm so thankful that the battle has already been won and ...Jesus is the victor. Learning to live in victory today is the challenge. But it helps to remind myself that I already know the ending and ...I'm on the winning side. So, in the midst of many challenging days when I become discourged and tired, I can continue to be thankful and praise God. How about you? Have you reminded yourself that you already know the ending? I find it amazing that God chooses to use me as His hands, feet and dare I say my mouth ...for His purposes in this world. If my job was done, I'd already be at home with Him. So, what's my response? Listen, obey and press on continuing in the work God has called me to do. Happy Thankful Thursday to you! it helps to remind myself that I already know the ending and ...I'm on the winning side. AMEN! And I say again, AMEN! Hi dear one, I loved this post-such encouragement and hope. BTW, I am a prayer partner with Lynn and would love for you and I to uphold eachother as well...so write me when you can. Have a blessed day...and joy for the journey. It's always good to be reminded that we win in the end. Thanks! Cute little graphic of the runner! Thanks for the reminder that we know the ending! Great post......and you are so right, it's the daily victories, or lack of them, that is the challenge. It is so good to know that my victory is not based on me, but rather Him. He has overcome this world. Alleluah! Another great post. Thank you this reminder. His promises bring such encouragement! 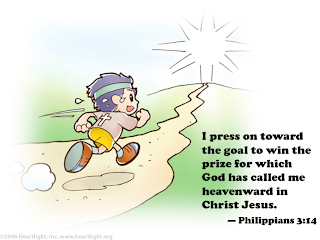 Love this: "Listen, obey and press on continuing in the work God has called me to do." You are always such a blessing. It was a plesure to be with you today. How very refreshing a spirit you are. He is watching , your husband...he sees you. It is his own wounded heart that his eyes stain away from. When he is safe he may show you. You will see oh how very tender a heart a man can have. Do not get too discouraged. Kindness be the rule of your heart.